UrTurn - Get Paid for Using Facebook! 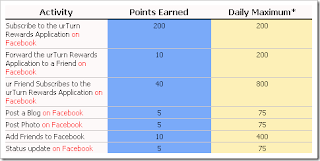 UrTurn offers reward points to users based on their activities on social networks like facebook. These reward points have cash value and can be redeemed for prizes like iPhone or sold for cash on the UrTurn marketplace. Activities includes, as expected, adding UrTurn application to your facebook account, inviting friends to use it. You will also get paid for daily activities like uploading photos, adding new friends, updating status on facebook. Also check list of prizes you can redeem UrTurn points for! As of now UrTurn is only available for facebook. They will be soon coming on MySpace as a widget. They have no donut for orkut users as of now, but considering recent support for third-party applications on orkut, they will soon arrive their too. 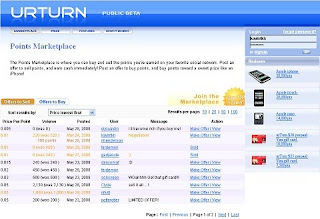 Then, you can make real money from UrTurn points, you’re required to trade your points at UrTurn points marketplace. Users are able to make real deal at UrTurn Points Marketplace like offers to sell and offers to buy. The current price per point is $0.005 - $0.015, depending on traders. For a reasonable price, an offer can be easily attracted by other traders in a very short period (1 - 2 days). How to gain more point? Let we see a point-activity chart is shown below…. What? Seriously???? I want it! !